The Grand Final of the 63rd Eurovision Song Contest will take place on May 12th at the Altice Arena of Lisbon, Portugal. Forty-three artists will take to the stage over three nights to perform their contributions for the contest, fighting to become the winner of the Eurovision Song Contest 2018. Over the next week, all of the artists will have the chance to rehearse on stage and make any last-minute changes to their performance before the live broadcasts. 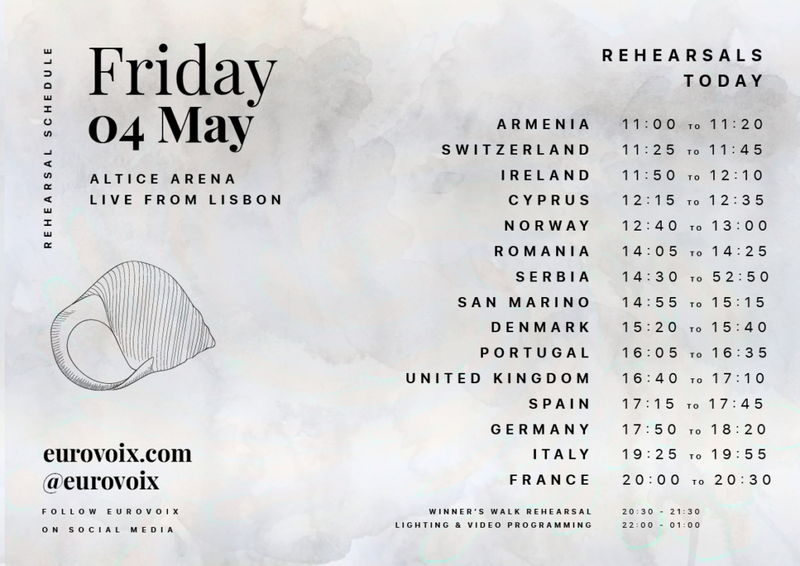 Today, nine countries will rehearse for the second time, while the Big Five plus Portugal will rehearse for the first time. 14:15 CET – Once again this is a performance that has concentrated on props rather than lighting etc. The staging is very dark and a lot of focus on the band, especially the main singer who is wearing a very striking purple dress. The backing dancers are incredibly in sync with their moves. 14:26 CET – There is a slight issue with technical equipment just as the second run through begins but the group do not seem troubled by this. It is refreshing to see so many instruments present on stage. 14:34 CET – Serbia have gone for very traditional Balkan staging. The female singers are very in sync with their movement and the harmonies are very tight. The addition of the flute and the drums gives a great Balkan rhythm to the song, it is great that both are featured on stage but the main focus remains on the four singers. 14:49 CET – All vocalists have remained strong for all three takes. This is probably the most on point and focused delegation of the day so far. 14:52 CET – Jessika is wearing a red dress in this rehearsal. Her accompanying robots are holding up more comical signs. One says “this is just a rehearsal”. The costume reveal has been removed from the routine. The dancers kick in a lot quicker than the first rehearsal. There are some technical difficulties with a few of the robots. Jenifer makes use of the runway for her rap in the song. 15:08 CET – This seems to be a harder routine for the producers to get ready. Once again a few of the ‘robot chorus’ were a little static or moved in the wrong places, this will need to be polished before the live shows in order to make the final performance as slick as possible. 15:16 CET – There are technical difficulties once more before the final run through of San Marino. 15:24 CET – There are a couple of shaky moments at the start of the first take with the microphone where Rasmussen’s mic was quieter than the backing singers. Vocally very strong and choreography was also very well done in the first take. Unfortunately there was a slight issue with the snow machine where it didn’t have full power. This hopefully will change when he next performs. 15:38 CET – The vocals and levelling in the microphones has improved greatly over the three takes. His vocals are a lot stronger and match the power of the song. The snow in the final few moments has kicked in a lot quicker for the final run through and is a lot more powerful. It’s look a lot more effective now.